Zucchini noodles, zoodles, zucchini pasta. Take your pick of the terms to use to describe spiralized zucchini. So it’s known by now that I like to dine out a whole lot. However, dining out doesn’t have to be heavy meals or processed junk. I tend to stick to meals packed with vegetables and that doesn’t always mean ordering a salad! Many restaurants in New York are now catering to food trends and their client’s desires by offering zucchini noodles. Spiralized zucchini is being served as a pasta alternative almost everywhere I go. And when I don’t see it listed on a menu, I wonder why the restaurant is so behind on food trends! 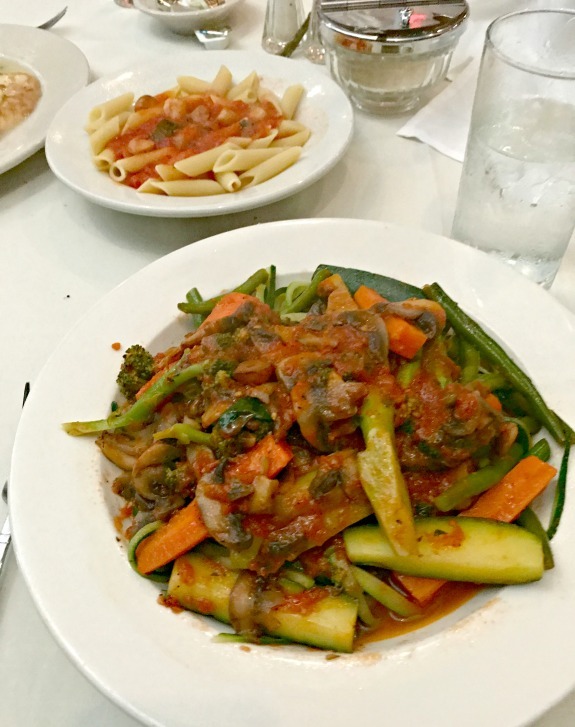 Here are a few of the best places for zucchini noodles in New York that I have enjoyed. 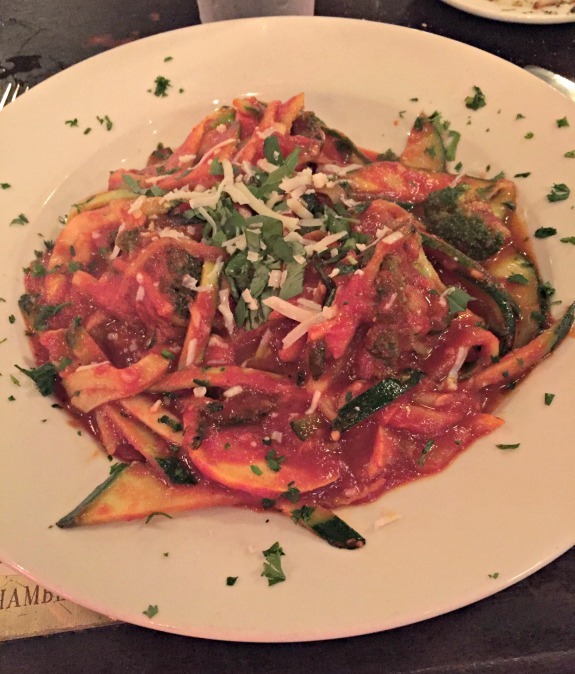 I recently had dinner at Bella Notte and got excited to see zucchini noodles on the menu. I asked for the zucchini bolognese to be made as zucchini primavera. 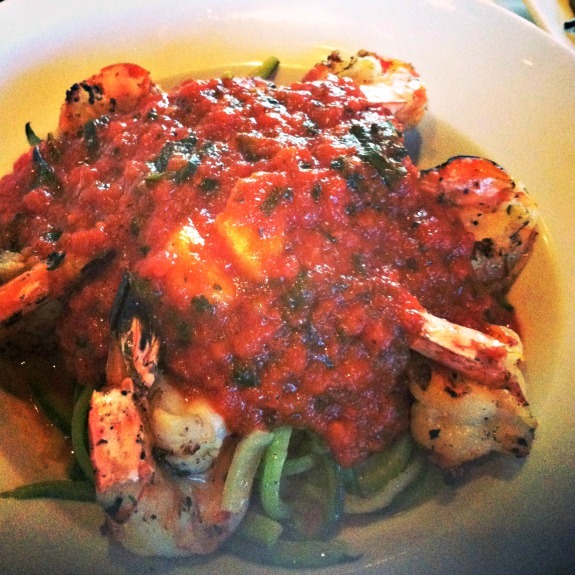 Served in a marinara sauce, this is usually my favorite way to enjoy this dish. 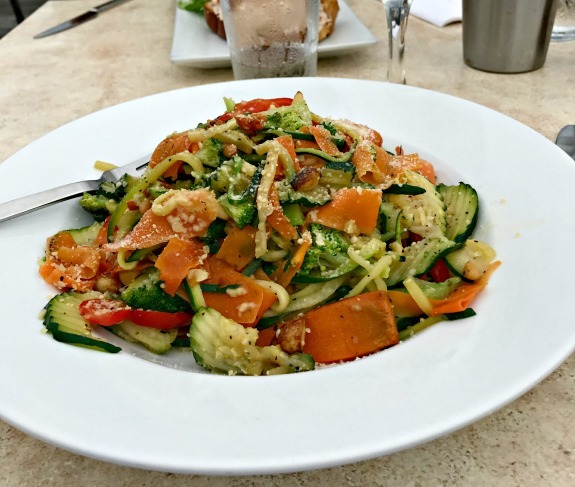 I love that Salt added this zucchini noodle primavera to their menu for this season! They were a little more creative than the other restaurants with this dish as it’s cooked in garlic and oil with roasted pine nuts and parmesan cheese. I just loved it. I’ve been going to Vincent’s Clam Bar since I’m a kid and even purchase their tomato sauce by the case to use at home. 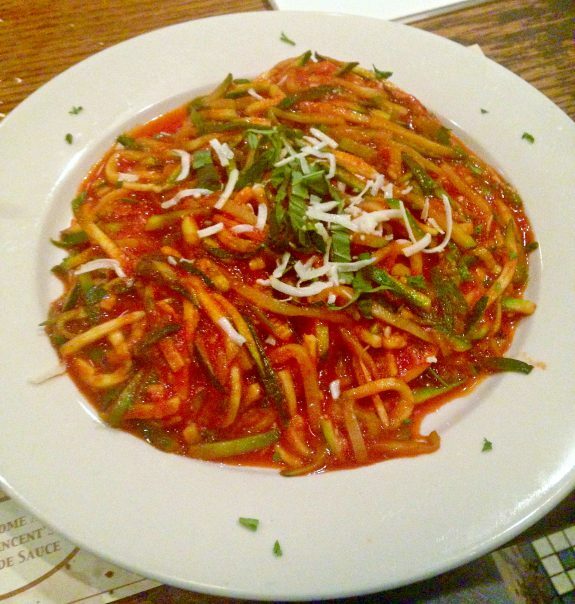 Anything covered in Vincent’s sauce is delicious and their zucchini linguine is no exception. It’s sautéed with their famous sauce plus the additions of mozzarella and Romano cheeses. There have been times though that I go to Vincent’s and ask for the zucchini linguine to be made primavera with extra vegetables too. Cirella’s Restaurant (they own Surf’s Out in Fire Island too!) has a whole section of the menu featuring zucchini options. They make zucchini ribbons and offer a variety of ways to have zucchini while also offering it as a pasta substitute. I last had the zucchini primavera for my birthday a couple of years ago. I really need to get back there! 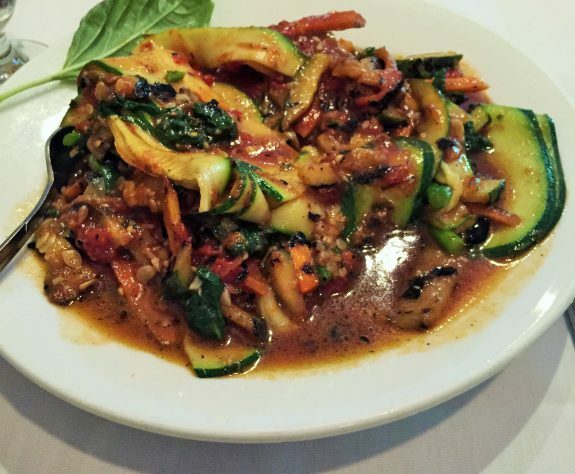 I am super annoyed that I don’t have a great picture from Andrea’s 25 because I LOVE ordering their zucchini entrees. They have a section of the menu featuring a few different ways to have zucchini (with vegan options too!) and all of them look good! Andrea’s 25 is really good about customizing your order. They are happy to make swaps and additions whenever you ask. Do you ever order zucchini noodles in restaurants? Do you make your own spiralized zucchini? I like at Andrea’s. I have eaten at the one in Westchester, near my home, but find the space to not be as nice as the Long Island one. They are eager to please and will change any dish around. My family laughs because I never keep a dish as is but always tweet it to what I need. the places I eat are always willing to accommodate. We like the Woodbury location ambiance wise over the Commack location but sometimes we think the Commack location is a better experience. Either way, i love their food! I’ve never had spiralized anything before! It seems super popular now. I guess it’s a good way to get in some extra veggies! ha! I should fly down and do a restaurant review trip. not a bad idea! I spiralze everything! I have never been to a restaurant that offers zucchini noodles but that is cool that they are starting to. I have never had zucchini noodles – I usually go for spaghetti squash instead. I should probably try zoodles, especially for when it’s too hot to roast spaghetti squash! I think I now prefer the zucchini noodles, they sit better in my stomach than spaghetti squash. Yum!! Great post. I usually spiralize my own zucchini noodles, I don’t think I’ve ever seen them in a restaurant near me! Awesome post! I’ve recently fallen in love with zoodles, and I had no idea that so many places have jumped on the bandwagon! The only place I’ve tried them at so far in NYC was Grey Dog Cafe, and that was really really good! It had pesto and parmesan and tomatoes, yum. So I finally broke down and bought a spiralizer to use on my kohlrabi and let me say, I totally get the craze now. First of all, it made the kohlrabi a hundred times more palatable and I used it on my zucchini too. It was also super tasty so I’m all about this new trend.